The Women's Business Council, an independent body created in 2012, is to be extended and will have a new Chair. Members of the Women's Business Council meeting Minister for Equalities, Caroline Dinenage MP. The previous Chair of the Women’s Business Council (WBC), Baroness McGregor-Smith will be stepping down from her role as the Chair of the WBC after 4 years. She will continue to support the WBC as a member and is currently leading a review in to the barriers faced by Black and Minority Ethnic people in the workforce with the Department for Business, Innovation and Skills (BIS). Replacing Baroness McGregor-Smith as Chair is Cilla Snowball CBE, Group Chairman and Chief Executive of AMV BBDO, an advertising and communications group. A long-standing and active member of the WBC. The new look WBC brings in 7 new members from a range of industries and from across the UK. The new members reflect a desire to bring more men to the WBC, encouraging senior men to act as visible agents for change. The extended WBC also ensures that industries with a traditional underrepresentation of women are present. 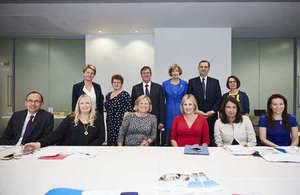 The refreshed Council will now extend its reach across more sectors than ever before; providing valuable insight into how to tackle the barriers to women’s progression and shining a light on the benefits to business of harnessing the skills, experience and talents of women throughout industry.